One of the many perks I’m looking forward to when my husband and I retire is traveling when we want, not at the whim of workplace calendars. Years ago, my husband was a photographer for a TV station and could not get time off during the rating “sweeps” periods. (OK, they did make an exception for the birth of our May baby.) Now he’s a teacher, and travel is limited to school breaks and the two months in the summer when the rest of the country is also on the move. Our travel bucket list includes the South by Southwest mid-March music and arts festival in Austin, Texas, the early-June Sea Music Festival in Mystic, Connecticut and Annapolis’ annual sailboat show in October. Also, we want to get snowed-in on Michigan’s Upper Peninsula with no worry about a return date and join the New England autumn leaf peppers on bike or car. Ok, enough about my future plans. Let’s talk about getaways that retirees and people with flexible work schedules can enjoy this winter. Depending on the weather and location, you can go cross-country skiing, winter hiking, snowshoeing, sledding and ice skating and maybe save money too. For instance, you can stay at Maumee Bay State Park on western Lake Erie and save 30 percent on rooms or cabins through March 31. Or head to eastern Lake Erie and stay at the Geneva State Park lodge during the week for big savings. 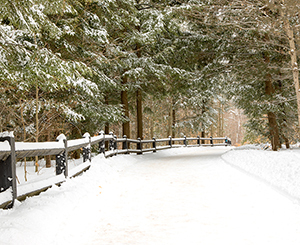 Winter weather is more predictable in Michigan, which has an array of state parks offering or located near downhill skiing, snowmobiling, ice fishing and winter camping. (Some parks rent equipment) They also have a packed winter calendar of events, featuring lantern-lit night hikes (with skis and snowshoes), candlelight cross-country skiing and several winter fests. You can even climb frozen waterfalls and experience fat tire biking and golfing in the snow. Regional state parks aren’t the only ones offering winter activities and deals. For instance, the Pennsylvania Great Outdoors Visitors Bureau lists lodging specials at cabins, lodges and inns, many with hot tubs, wood burning fireplaces and other amenities. What about Visiting the 3Cs? Cincinnati, Columbus and Cleveland are vibrant cities with top-notch museums, restaurants, hotels, shopping and sightseeing. Most of us are familiar with all that nearby Cleveland offers, but our urban neighbors to the south are hopping too. I grew up in Cincinnati and during visits back home in recent years have stayed downtown in the Hampton Inn, former home of the Cincinnati Enquirer, and the historic Netherland Hilton, visited the National Underground Railroad Freedom Center, toured the revitalized Over-the-Rhine (and its colorful outdoor murals), eaten ribs at the landmark Montgomery Inn Boathouse (and, of course, Skyline chili and Graeter’s ice cream), biked the Loveland trail and swam at the nearly 100-year old Sunlite Pool. Downtown Fountain Square, with the restored 1871 Tyler Davidson Fountain, a seasonal ice rink (open until Feb. 18) and outdoor concerts and events. The New York Times listed Cincinnati as one of the 52 Top Places to Go in 2018. Also on my bucket list is spending time visiting Columbus beyond the eclectic shopping I enjoy at Easton Town Center. And Columbus was #47 on The New York Times 52 Top Places to Go in 2019.
and bike the Scioto Trail. Columbus is also home to one of the largest Gay Pride parades in the Midwest attracting more than 700,000 people. This year’s parade is June 15, just at the start of summer travel. Stay tuned.